As far as textbooks go, a tome on astrobiology is a peculiarly difficult beast to get right. The interdisciplinary science of astrobiology is very broad, reaching across many different fields, and so not only does a textbook need to balance this breadth of diverse subject matter with the meaningful depth of coverage of each topic, but it also has to be comprehensible for students from very different backgrounds. Yet Cockell pulls this trick off admirably well in this latest textbook introducing the field. ‘Astrobiology: Understanding Life in the Universe’ is based on Cockell’s own research expertise in astrobiology, as well as his experience in teaching the subject on his successful (reaching over 50,000 students to date) Massive Open Online Courses (MOOC) and the undergraduate taught course at the University of Edinburgh. 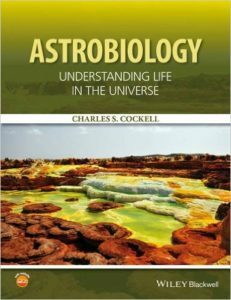 The book provides a comprehensive overview of the component research fields within astrobiology — chemistry, biochemistry, microbiology, planetary science, astrophysics and exoplanets — and works well across the vast scales of both time and space inherent in any discussion of the possibility of life emerging elsewhere in the universe. The crucial topics covered across the chapters include the molecular structures and energetics of life, the limits of the biosphere on Earth, the development of our own planet and changing conditions on its surface, the deep-time evolution of life, how exoplanets are detected, and which may be the most likely to harbour life. There are dedicated chapters on Mars and the icy moons of the gas giants, and even an introductory chapter on the historical development of ideas leading to the modern science of astrobiology. The text is very well supported with carefully-chosen images and diagrams — many created bespoke by the author — and each chapter is capped with a summary of the material just covered and recommendations of the key academic papers for further reading. The Appendix provides useful data tables, and the Astrobiological Periodic Table, colour-coded for both the astrophysical sources of the elements as well as their functions within biology, which went viral on science blogs last year. Another nice feature is that the book includes short profiles on particular astrobiologists, showcasing their research interests and career paths, and so highlighting the diverse routes that you can take into astrobiology work. At just over 400 pages this textbook is able to offer a decent discussion of all the most important subjects in such a broad and interdisciplinary field, without becoming unwieldy. And the further reading suggestions provide excellent jumping-off points for students wanting to explore particular topics in more detail. My only slight criticism is that it would have been handy to have provided a full bibliography of references at the back of the book, collated from the short end-chapter lists. In all, a hugely useful resource for new students of astrobiology, regardless of your background or ‘home’ discipline.